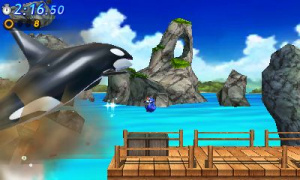 Sonic Generations for the Nintendo 3DS system will be released later in November 2011. Of course things can still change and SEGA has put back its 3DS releases before — CRUSH3D and Shinobi stand out — but for now it looks like Sonic is racing to 3DS in November. There's been Internet grumblings recently that Sonic Generations might overshoot its projected November release date and land in 2011. Oh cool then, I can't wait to play it next month. I am in same situation as tynerds37. I find myself in this huge time gap of not any good games that would interest me. release a good games regularly. not everything in one month. this is a bad tactic because noones gonna have money for everything thats released at the same time. Okay.. im going to buy Mario Kart 7 and Resident Evil Revelations, im think that that are enough 3DS games for the next 3 months.. so i dont buying this game. Good. This game was meant for Sonic's 20th birthday, and by gum, it's going to be released for Sonic's 20th birthday! I'll be picking up the 360 version so the 3DS version doesn't really bother me if its a little delayed. But for those who have it preordered or are picking it up.. Hope its smoothing sailing for you 3DS owners getting your copies on Nov. I would pick this up if it wasn't for SM3DL. So this will be going on my X-Mas list. Sooo... we're getting pretty close to November... we can haz releess date pleaz? For everyone that has a Xbox 360 or a PS3 (I have the PS3) there is a Sonic Generations Demo coming to Xbox and the European PSN Store on October 18, 2011. All of the American PS3 owners will have to wait until next Tuesday on October 25, 2011. The Demo has been confirmed to have Classic and Modern Sonic's take on the Green Hill zone. @3DTredder: Any demo for the PC version? 'Cause that's the one I'm interested in. Classic is gonna be the 3DS thang. I mean, things like the tanooki suit in MK7 and SM3DL, and Frogger 3D, and Sonic Generations.....And all of those remakes like StarFox and OoT. noooooooo! i wanted it to be delayed to 2012 because so they can have a longer time to remake green hill and to have more time to work on the newer levels.please change your mind sega! honestly im skeptical about this sonic game, Sonic team has just made one flop after another with too many promises of putting sonic back in its old spotlight. still they fail to deliver and they cover it up with fancy cinematics. this looks like a game i would rent first to check out the gameplay and then ill decide if i get it. I really hope this is good, Sonic Colours was good so fingers crossed. Depending on what month it drops in I will day one it if it reviews well, if not maybe pick it up after a price drop along with Shinobi.